The first main step to any successful telemarketing campaign is to make sure you fully understand your target customer. It is imperative you know your audience because the marketing channels and messaging that apply to one person, may not be as effective with another. You will need to build the ideal client profile to ensure the language advertises to the right people. Demographics: One of the best way to identify your market is by looking at their shared traits. The demographic describes a target market in terms of its socioeconomic characteristics. Your target market is made up of people who share a feature or features, and who buy your products or services. Demographics can include age, location, income, education, gender, marital status, etc. Psychographics: While demographics give you some insight, psychographics explores how the target thinks and behaves. To understand why your target market buys your service or product, you need to be aware of their taste and needs. Considerations should include ethics, culture, religion, lifestyle preferences, etc. Another tool for crafting your client profile is by identifying and analyzing your competitors who are currently in the marketplace. Scroll through their website, social media feeds, and check out their press releases. This not only helps build your profile, but also allows you to evaluate areas for opportunity. There might be a niche market they are missing, or a better way to differentiate yourself from their offerings. Once the ideal client is down on paper, consider immersing yourself more into their lifestyle for a better look at their day-to-day. You can do this by engaging on social media. There are groups across LinkedIn that are full of active participants who want to share knowledge and input on topics that may be of interest. You should also go to events they may be hosting, exhibiting, or attending. You can learn a lot about your target not only through how they act, but how they interact with other organizations. 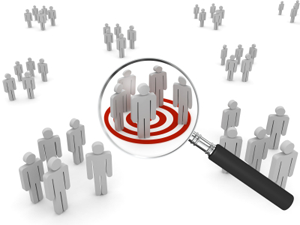 Identifying your target audience is a necessary part of your business’ success. By knowing the right people and companies to pursue and how to connect with them, you can enhance the quality of your client engagements. Do not forget though that the marketplace can change quickly, so you must remain diligent on identifying and analyzing your target audience regularly, so you can be one step ahead of the competition.